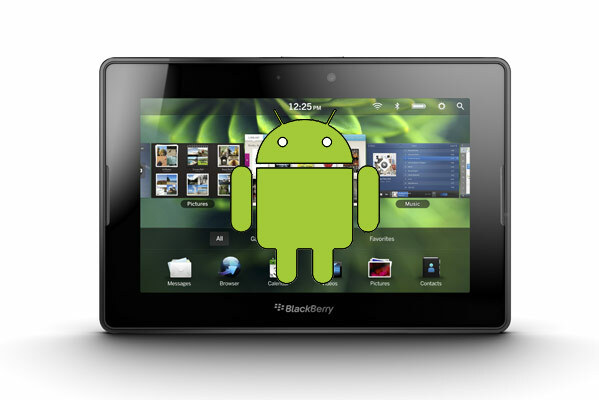 Wanting Android apps on your PlayBook? Or Beta apps like the AngryBirds? This only works on old non 2.0 Beta OS users running 1.6. Below are some handy steps (and quick download links) for installing Android on your PlayBook. Its pretty quick and takes about 10 minutes if nothing goes wrong. My instructions are a little bit different than everyone else, but thats because I ran into three problems during the setup. By following these steps you should be a-0-k with minimal effort. In addition, as a disclaimer, if something goes wrong… well your stuck googling it to find an answer because this is not RIM recommended or approved. Before all else – Backup your BBPB. Note: Some people can install right to the 1.0.7 version. However, I’ve seen at least one system not work on that release. Also Note: When you run the app, it will warn twice that files are missing – THATS ok press continue. If it says Java missing, file will exit however – that means the JDK isn’t being detected and the file wont reach the PlayBook. What can I install now? Any APK’s you send to your device will appear only inside the Android Emulator. So, you need to make sure it is installed first. Also, if you do not live in North America, you cannot use the BlackBerry App Store. In that case you will need to find BAR files to install such as some of the ones I put below. Note: Some of these are demo apps and not finished yet. Note: This may or may not install. Try other APK’s, I found a bunch that worked this one didn’t for me. You can sideload the bars. Dont bother sideloading the android player – your os2 already has one and it would conflict with this one. You no longer want to sideload the Android Player. It only worked for earlier versions of OS1. Now a days you need to use the dev beta of OS2 – not recommended or wait until february :).